My long-time client called me up to tell me that she was graduating! Yass!!!! Naturally, she wanted me to capture her graduation portraits. The portraits would also include her one-year-old son. 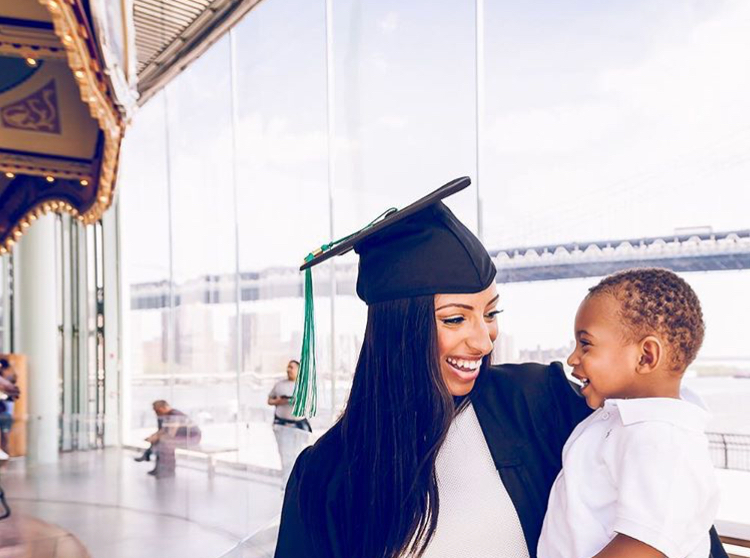 After a consultation, we both decided that NYC’s Brooklyn Bridge Park would be the best place to capture her mommy & me graduation portraits. What I love most about being a photographer is creating portraits that inspire, empower and celebrate my clients. I love to create images that have meaning to my clients. Art that they will be proud to hang on their walls and hold a special place in their heart. This session was super special for my client and me because we are both mom’s realizing our dreams. When you become a mom at least for me, it’s fun and exciting. However, you also get a slew of unsolicited advice some good, some bad. Sometimes you even get told what you can’t do (insert eye roll here). Not only had my client given birth, lost all her baby weight, reclaimed her six pack but she was graduating with several internships lined up! This Mom was out here crushing her goals. All with a baby in tow. I remember when we were shooting a dad walked by with his two little girls and he said “You see her. You can do anything at any time don’t let nothing stop you!” Those words ring true you can be a mom, a superhero, a boss, and whatever else you decide to be!